Next month, ELAW will convene locals who are working to protect the climate to share local and global climate solutions. 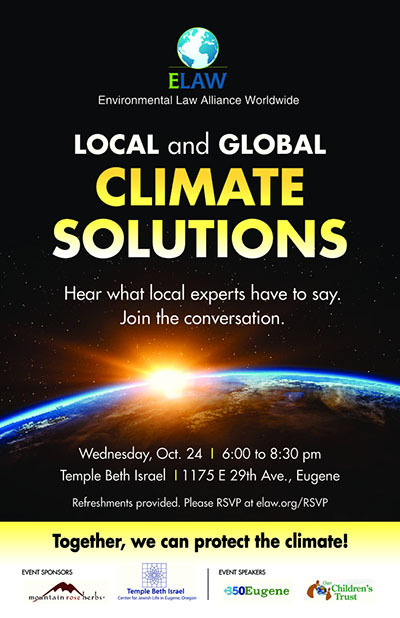 Hear from local experts, including ELAW Staff Attorney Jen Gleason, Temple Beth Israel Rabbi Ruhi Sophia Motzkin Rubenstein, Our Children's Trust Community Engagement Manager Coreal Riday-White, and 350 Eugene co-founders Patty Hine and Deb McGee. Please RSVP at elaw.org/rsvp or contact ELAW Community Liaison Krista Shennum at krista@elaw.org. Many thanks to Mountain Rose Herbs for making this event possible, and to Cafe Yumm for providing food.